Fly into Wanaka or Queenstown, and be met by your iTrek hosts. Transfer to George and Mary’s bed and breakfast accommodation in the idyllic mountain setting of Lake Wanaka. Sleep in, and enjoy your first day surrounded by the mountains. Tonight’s meal may be a typical New Zealand barbeque, with succulent lamb or venison, local produce, and finishing with a pavlova for dessert. Why not try a sample of Wanaka beer, or world-renowned Central Otago pinot noir? 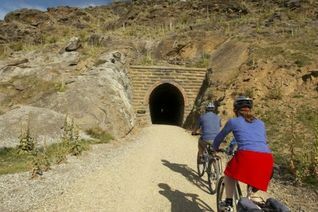 iTrek will transfer you to the start of the Otago Central Rail Trail. Meet your guide and be fitted with your cycle. You will have time to explore the former gold mining town of Clyde, and have an easy 8 kilometre ride to Alexandra. Today cycle 28kms on to Omakau , enjoying billy- tea and home -baking, dining at historic taverns, viewing historic gold mining towns, and riding over a suspension bridge. 45kms cycling today, as you travel onto Wedderburn. You pass though the Poolburn Gorge, featuring two tunnels and two viaducts. Depending on the season, there an opportunity to try your hand at the ice sport of curling. Cycle 43 kms on to Hyde, with the highlight being the section of track alongside the Taieri River. Depending on time, you might like to visit to New Zealand’s largest working gold mine. Travel today to Gore, and spend the day viewing George and Mary’s sheep and deer farm. George will shear a sheep or two for you, before you travel on to Lake Manapouri. 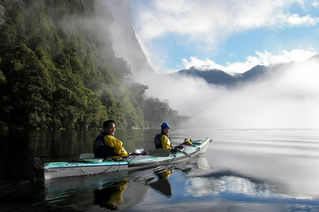 Begin your kayaking trip by paddling down the main reach of Doubtful Sound, watching for seals and penguins. Your campsite tonight is in a sheltered bay beside a waterfall. Explore Crooked Arm, which is a playground for bottlenose dolphins. After lunch, weather permitting there is time for a swim, and maybe put up the sails. Today we paddle down the southwest shoreline of the Sound, into Deep Cove. Normally the sails are put up for this final stage, ending on an exhilarating note, or an “America’s Cup” challenge. Travel back to Wanaka. A day of leisure in Wanaka, with activities of your choice (see day activities) or maybe just relax and enjoy a hot pool after your exertions. Relaxing in Wanaka. Why not explore the stunning lakeside on foot, try rock-climbing or an art tour? 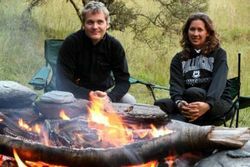 Drive to Queenstown and start your gentle walk to Broderick Hut where you will spend the night. (Read more). Climb 1400 metres to enjoy stunning views from your lofty campsite for the evening. Descend through an open hanging valley from alpine peaks into native bush. A helicopter will transport you to the rafting camp where you will enjoy a delicious 3-course meal. Today you have a 5-hour river trip, catering from action to the sedate, arriving in time to go fishing before dinner. After your meal, you may want to discover the glow-worms. Rafting in the morning, and a side hike in the afternoon to see the waterfalls. This is the end of your rafting, and you are transported back to Queenstown. A liesurely day in Wanaka. There is time to buy gifts for home, enjoy a wine tour or a relaxing massage. Your iTrek hosts, George and Mary say "Goodbye", and deliver you to your plane for your trip home. Your head will be buzzing with happy memories of your New Zealand experience.